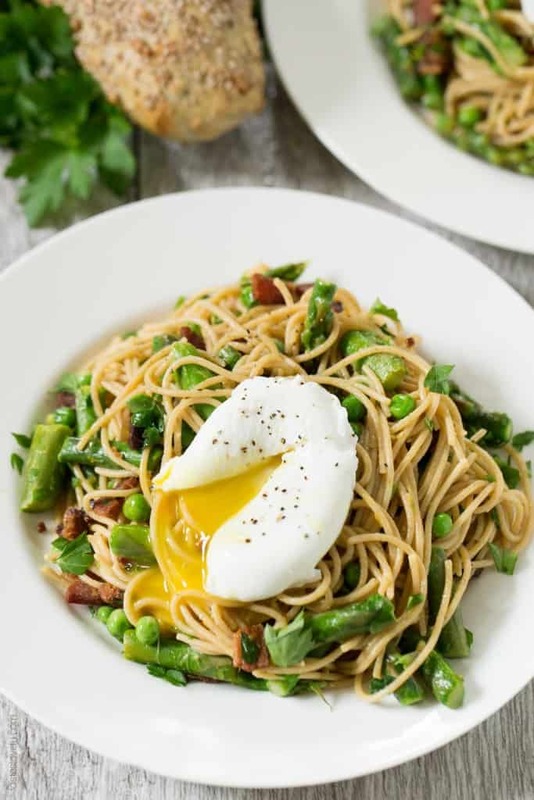 Spring Pasta with Bacon and Poached Egg – whole grain spaghetti with asparagus, peas, lemon, parsley, crispy bacon and topped with a poached egg. 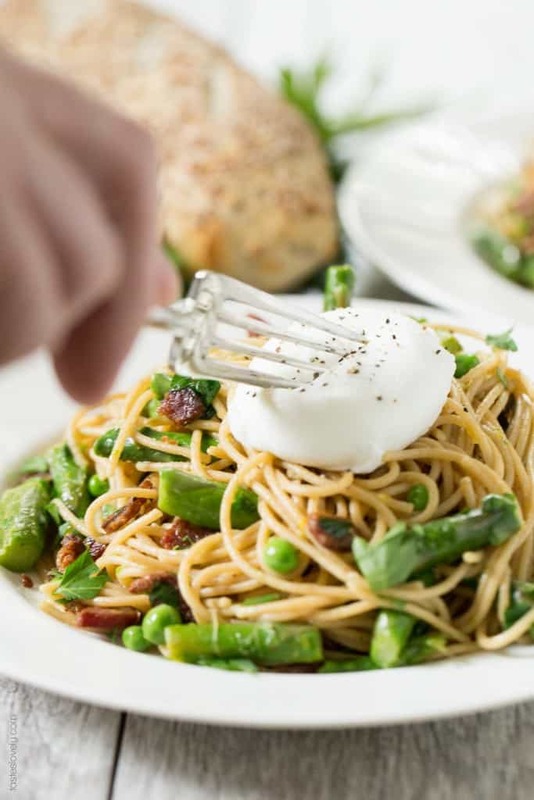 Tastes like a lighter, healthier spring time spaghetti carbonara! I’ve decided that having a winter baby is the very best time to have a baby. I had Josh in the middle of November, and we pretty much spent all winter cuddling on the couch all cozy and warm. My days and nights consisted of baby snuggles, nursing, sleeping and staring at my cute little boy pretty much on repeat every 3 hours. It was bliss. It took about 3-4 months for me to feel like I had somewhat of a handle on this beautiful new way of life. It takes time for little babies to get used to being in the world, and for moms to get used to having needy, adorable babies. I started feeling like I had it “together” just as soon as the days warmed up and the sun was shining. Now we go on walks every day, and venture out on at least 1 errand a day. I feel like a momma bear who has been hibernating all winter long finally emerging from my cozy cave with my new baby bear cub. With these warmer, spring days comes some gorgeous spring produce. I took Josh to the farmers market with me on one of our adventures out to the real world, and couldn’t resist the asparagus and peas and meyer lemons. I had to have them. 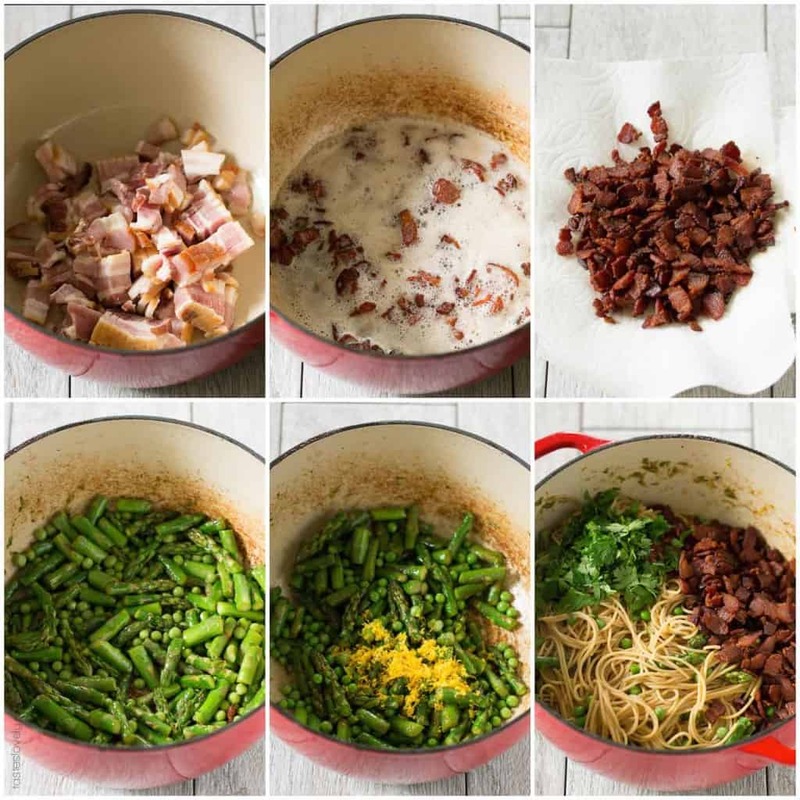 I used these ingredients to make a spring time pasta with bacon and a poached egg. The taste is beyond delicious. 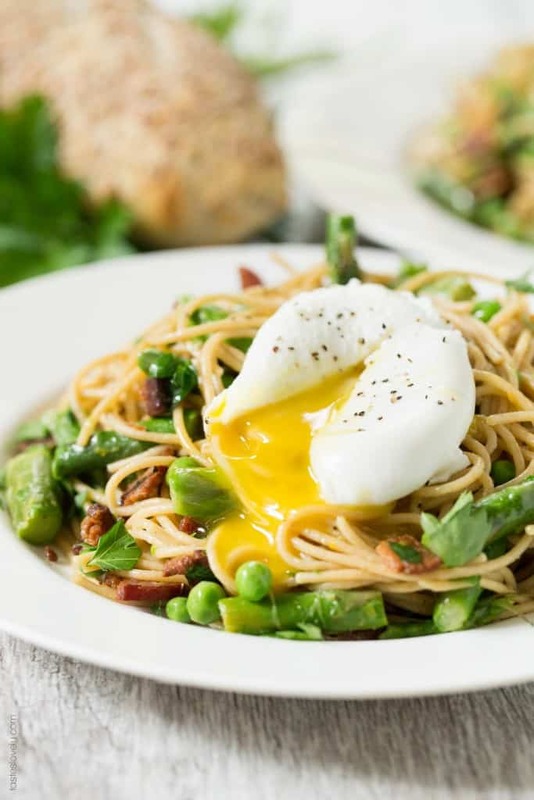 The bright green and delicate asparagus, green peas and parsley brightened up with the juice and zest from the lemon, crunch and saltiness from the bacon and all topped with a creamy, fluffy poached egg. The sauce for the pasta is just a little bit of the bacon drippings, some lemon juice, pasta cooking water, and the runny egg yolk. 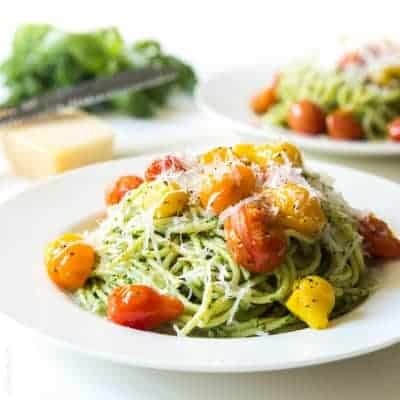 It tastes like a healthier, lighter deconstructed spaghetti carbonara. And it’s a pasta that you could totally serve for brunch too. You’ve already got the bacon and eggs. To make this pasta dish even healthier, I used Barilla Whole Grain Spaghetti. Their whole grain pasta is made with 100% whole wheat. A much more health conscious pasta choice. 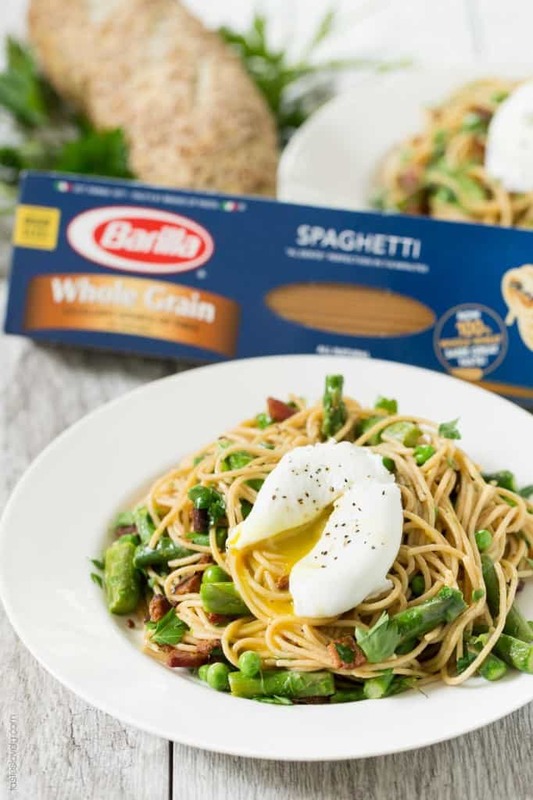 Barilla has the best whole grain pasta I’ve used. Other whole grain pasta’s get gummy or feel grainy after cooking. 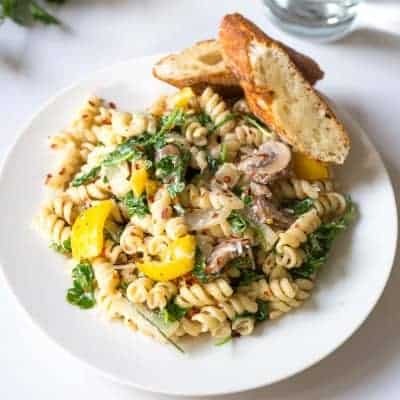 But Barilla’s Whole Grain Pasta is light and delicate with the perfect al dente bite. In a dutch oven (or large skillet), cook the bacon over medium heat until crispy, stirring occasionally, about 10 minutes. While the bacon is cooking, fill a large, tall sided skillet with 2″ of water. Heat over medium heat. Line a plate with paper towels. As soon as the bottom of the pan gets small bubbles on it, crack each egg into a small bowl, and slowly pour each egg into the water. (If your egg isn’t very fresh, the whites may start to spread, gently use your spoon to swirl the water around the egg, and nudge the whites together.) Let the egg sit in the water for about 30 seconds, until it is *just* starting to turn white on the bottom. Then, use a spoon and gently flip it over in the water. Continue to cook for another 3 or 3.5 minutes. You will know the egg is done when you lift it out of the water with a slotted spoon and the whites are set, but the center is still jiggly. Transfer the poached eggs to the paper towel lined plate to drain the water. Set aside. Start boiling the water, and cook the pasta according to manufacturers instructions. When the bacon is crispy, transfer the bacon to another paper towel lined plate to drain. Pour all the bacon fat into a bowl. Return 3 tablespoons of the bacon fat back to the dutch oven and continue to heat the dutch oven over medium heat. Add the asparagus, salt and pepper. Cook for 5 minutes until the asparagus is crisp tender, stirring occasionally. Add in the peas and cook another 1-2 minutes until the peas are warmed. Turn the heat to low. Add the lemon zest and lemon juice. When the pasta is done cooking, reserve 1 cup of the pasta cooking water. Drain the pasta, and transfer the pasta to the dutch oven with the asparagus and peas. Add in 1/2 cup pasta water, the cooked bacon, and the parsley. Toss the pasta together. Add more pasta water if necessary. Taste for salt and pepper, add more if desired. 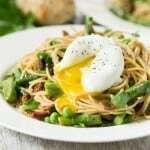 Serve the pasta warm, topped with a poached egg. *You can see step-by-step photos of exactly how I poach an egg if you’ve never poached an egg before. This post is sponsored by Barilla. All opinions are my own. Thanks for supporting the brands that support me! This looks so good! I am all about asparagus right now! I loooove poached eggs on anything! 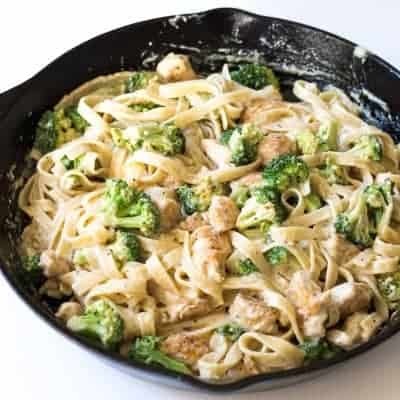 This looks so good – love all the veggies in that pasta! 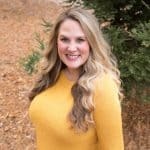 And it took me quite a while to get comfortable with a mom schedule as well. Now we take Em to the farmer’s market every week. She always gets a free apple or orange and absolutely LOVES it! Yes, poached eggs on EVERYTHING! I can’t wait to take Josh to the farmers market and let him sample the food. I think I’m going to start trying solids with him in a few weeks! Thanks Julie! This would definitely be a great date night dinner!